A ten-year career is a monumental achievement. Death have reached this milestone with the musically superlative release, "Symbolic." 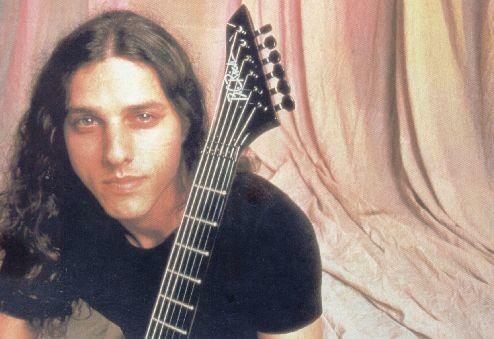 But it's never been easy for Chuck Schuldiner's band... always struggling with important changes: besides the once again revamped line-up, "Symbolic" features a change of producer (changing from Scott Burns to Jim Morris), as well as a change in label, moving to Roadrunner from Relativity. These are all good topics of conversation with Chuck, so let's go. "My God, there always was so much to do, things that aren't strictly connected with music. We've changed labels in the U.S.A. which was really a nightmare. Then two months after our last tour, just when I was completely involved with the songwriting, Steve left us. Normal administrative catastrophes. But fortunately I have with Kelly Conlon on bass and Bobby Koelble on guitar, two absolutely incredible new musicians, moreover both are from Orlando as well. Now I realize how difficult it always was to work with musicians who live all over the globe. 1994 was a year of big changes, but we took a good step forward. "Individual Thought Patterns" did very well in Europe and probably the supporting tour was the best we ever did! In the States the results were also very flattering, considering the fact that we had to do it all by ourselves, without any support from our old label RELATIVITY. We've been with them for many years but we were never regarded as important, never got the attention that we were worth. Eventually I understood the reason of this lack of interest in our band: RELATIVITY didn't want to deal with metal bands anymore! Simple, right? We were the last hard-rockers left on their roster and they probably wanted to get rid of us, well finally we satisfied them! ROADRUNNER followed us for a long time, so it was not hard to get a deal with them. Now we're ready to start a new adventure, certain of having the right promotion behind us! In the past, the promotion has always been neglected by label managers, however the various metal magazines didn't neglect us, and we want to give them our sincere 'thank you'!" Modestly, we just try to do our job. If that means we can support such an unbelievable band as Death, I guess we must increase our efforts! Anyway, let's start talking a bit about your recent (master) piece "Symbolic". First of all, why did you choose Jim Morris to be the producer after many years of cooperation with Scott Burns? "This time we contacted Scott also, but unfortunately he already had other commitments that he couldn't put off, so choosing Jim was pretty natural. For quite some time already I had wanted to work with Jim, and his name was the first and only that I thought of as soon as Scott cancelled. Jim is very experienced and besides working with many groups, he can deal excellently with different musical genres. To me this is an absolute primary quality, because DEATH is not just a metal band. Mainly on the latest albums you can hear the variety as a product of all our influences. Above all, we are on the same train of thoughts, sometimes it seems that he can read my mind! I have the feeling that we'll work together for a long time." So you didn't have any problems to make Jim understand what sound you wished to obtain, did you? "Definitely not! He knew very well who we were and what we did in the past, he understood right away that we wanted to make a 'true' record, on which every instrument would have its own dimension. We played at our best, in a large studio and with very good instruments, he put in his producing skills and a lot of humanity. Everyone can hear the result!" "When we came to the studio, we already knew perfectly in which way "Symbolic" would be different from the previous albums. Gene Hoglan and I absolutely wanted to introduce more fullness, and different feelings. We wanted to explore new structures. We worked a lot with demos and it was quite a magical process. Things almost came from conscious, because we were extremely concentrated, we realized what was happening and we were able to strengthen new impulses. We did many experiments, a lot of research, it was an incredible and intense process. It was a bit like going out of routine. It's so easy to jam chords and rhythms and restart to write by standard procedures, but we wanted to do things at our leisure and we heard and understood what certain sounds wanted to tell us." 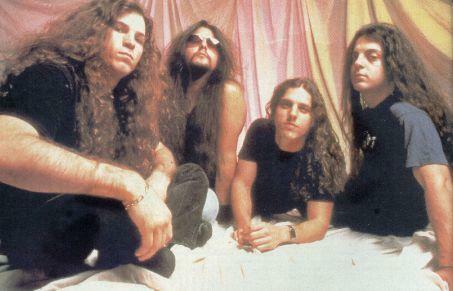 DEATH are famous for their sudden and never ending line-up changes. Let's take away the personal side of the problem, and rather focus on the new line-up. Where did you find these new technical 'monsters' known as Kelly Conlon and Bobby Koelble? Where have Steve DiGiorgio and Andy LaRocque gone? "Well, first of all, I want to underline that it does not depend only on me to make a band member stay! I tried everything to make Steve remain with us, but there was nothing to do, his wish was to do new musical experiences and I respected that. It wasn't easy to leave each other after a three-year partnership, yet so it went. We were left bass-player-less. Talking about the situation with some friends who play in a band called PAIN PRINCIPLE, Kelly's phone number came out. I called him and he offered to jam with Gene and me. Besides he knew a lot of our material, he soon showed to be a very positive person, a quality I think to be fundamental for the people I oughtta work with. At that point Andy (LaRocque) didn't seem available to follow his cooperation with DEATH and so shortly after I phoned an old high-school friend, Bobby Koelble. I remembered him as a phenomenal guitarist but that was almost 10 years ago. We didn't keep in touch, it seems unbelievable, but now he's in DEATH as well and his work on "Symbolic" was excellent! I must give infinite thanks to Kelly and Bobby, because they joined the band with a praiseworthy enthusiasm and worked very hard to learn the songs in a very restricted timeframe. 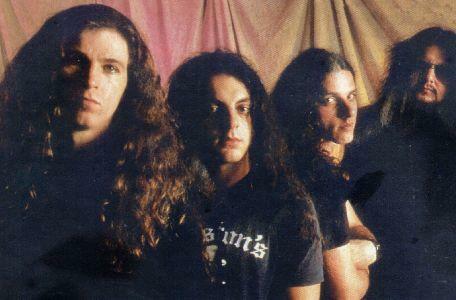 Beyond that, they're not involved with other bands or side-projects, such as Steve and Andy were. In short, all ingredients for a lasting partnership!" This time you wrote all the music and lyrics again, doesn't 'poor' Gene Hoglan feel clipped of his creativity? "Ah, ah! I don't think, Gene writes all the drum parts and does it totally freely. I give him a tape with the riffs of a track, then he does the rest, he's a master with his instrument and I wouldn't dare to tell him how he must or must not play a song. We work together very well, and each of us knows what to do." Your lyrics don't seem as 'pissed off' as in old times, do you think this is also due to the solid situation created inside and around the band? "Well, it's futile not to believe that working with professional people who always know what to do, gives you a certain tranquillity. This new situation is obviously reflected in my way of writing the lyrics as well. Less rage and more reasoning, I'd say, yet always keeping the reality-link that in the past characterized my lyrics. After the release of "Individual Thought Patterns" a lot of people wrote me telling me that they recognized the lyrics that I wrote. The reality-link is my fundamental way of writing lyrics, which I can't deny. I can't tell fantasy stories in my songs. Many bands do it, especially in Metal, I don't. Lyrically "Symbolic" is less angry than the previous records. There's an aggressive feel on this album as well, yet I'm a happier man than I once was, simply because now things for me work better than before. In general the lyrics as a whole are a reflection of my life. To me the title track in particular, is very important. "Symbolic" tells about life's theme, about changes we don't feel when we are living them. They become symbols once we look back, events that came on our path and now represent a step forward on the road of life. If I think about my childhood again today, I'm surprised about the findings that arise, just very small events being at the base of that." From your words it seems you decided to stop for a while to balance out your life and the result is "Symbolic".... isn't that so? "I'd really say yes. It was a thing I was busy with a lot the past year. I'm looking at my life now from a new point of view. I recorded it again minding these symbolic events, and I learned to love youth's innocence more than anything else. Sometimes I wish there was a drug that was able to give back this child's innocence to a person, so that your adult consciousness can forget all the pain of things we see in this world." This sounds a bit as if you already feel as an old person. Usually only when facing death, your life turns into this kind of image, doesn't it? "If you put age and experience on the same level, I surely have got a lot of it. Yet, to me another gift is important; looking back on what was good emerges more easily longer lasting, than looking back on the frustrations, the hate. I know perfectly that I sometimes behaved like a jerk, simply because of the frustration I was in and consumed by.... I can forget it now." Having talked so much about the past, Chuck won't lose the chance to underline the symbolic character of the record after ten years of band history. "I think I've learned one thing, after going through as many painful as good moments in my career; everything that happens, happens for a reason. To have reached the point were I am now, is due to what happened in the past. From this point of view, the title perfectly describes how in these nearly ten years of band history, something had to come out like what we find on "Symbolic". Something beautiful....."